The National Science Foundation-funded Ocean Observatories Initiative (OOI) is an integrated infrastructure project composed of science-driven platforms and sensor systems that measure physical, chemical, geological and biological properties and processes from the seafloor to the air-sea interface. The OOI network was designed to address critical science-driven questions that will lead to a better understanding and management of our oceans, enhancing our capabilities to address critical issues such as climate change, ecosystem variability, ocean acidification, and carbon cycling. The OOI has transformed research of the oceans by integrating multiple scales of globally distributed marine observations into one observing system and allowing for that data to be freely downloaded over the internet in near-real time. The OOI will continue to deliver data and data products for a 25-year-plus time period within an expandable architecture that can meet emerging technical advances in ocean science. The Endurance Array is a multi-scaled array utilizing fixed and mobile assets to observe cross-shelf and along-shelf variability in the coastal upwelling region of the Oregon and Washington coasts. The array also provides an extensive spatial footprint that encompasses a prototypical eastern boundary current regime and connectivity with the Cabled Array. The backbone of the Endurance Array includes two cross-shelf moored array lines, the Oregon Line (also called the Newport Line) and the Washington Line (also known as the Grays Harbor Line). Nominally, the Oregon Line is located at 44o 35’N, -125oW to coast. The Washington Line is nominally located at 47oN, 125oW. Each of these lines contain three fixed sites spanning the slope (~500-600 m), shelf (~80-90 m) and inner-shelf (~25-30 m). The three sites across the shelf and slope are associated with unique physical, geological, and biological processes. All six sites contain fixed sensors at the top and bottom of the water column paired with an adjacent water column profiler. 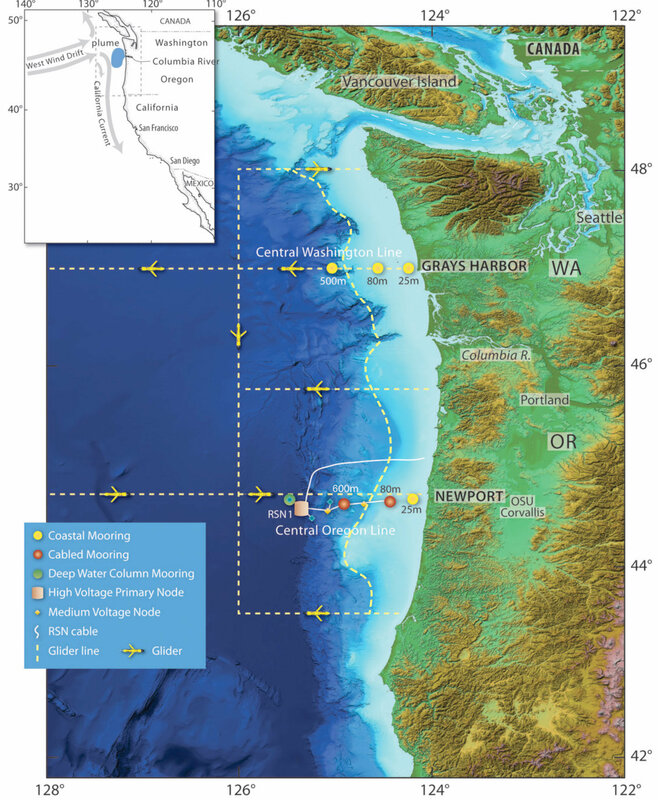 The Oregon and Washington Lines are both affected by wind-driven upwelling and downwelling, but shelf stratification and upper-ocean properties are influenced differently at each location by the Columbia River outflow. The Washington Line is North of the Columbia River outflow and the Oregon Line is South of it. Observations at both locations allow for a greater understanding of coastal ocean ecosystem responses to climate variability. Mooring lines provide synoptic, multi-scale observations of the eastern boundary current regime. Coastal Gliders bridge the distances between the fixed sites and to allow for adaptive sampling. Seacast.org delivers an easy-to-use interface for Oregon coastal fishermen that shows forecasted sea conditions for a three day period. The projections are determined using models provided by Oregon State University's College of Earth, Ocean, and Atmospheric Sciences (CEOAS). Seacast displays forecasts for currents, sea surface temperature, wave height and wave direction. These conditions are predictions, much like weather forecasts, based on scientists' models. They do not represent actual, real-time readings of ocean conditions, although the models do incorporate actual readings to create the predictions. The Seacast website produces a visual display of these conditions, as image overlays on top of a Google Maps background. The models used by the site, like all models, have limitations. The Seacast team would like to receive your feedback about both the layout of the website, and the accuracy of the data displayed on the website. This will allow us to improve Seacast, and give feedback to the model creators about their model.